One way of comparing the sets is to look at the frequencies of the words in Chinese. Words that are more frequent in a language tend to be easier to learn, because the learner is exposed to them more often and in a variety of contexts. I did an analysis based on each word’s frequency in the corpus of Lancaster Corpus of Mandarin Chinese (LCMC). For the words that were not found in the corpus, I made a small improvement in the matching by removing the 儿 ending from erhua words when the corresponding base word was in the corpus. While most of the other unmatched words were truly rare, a few common words are not. For example, 公共汽车 (gōnggòng qìchē, bus) and 不客气(bù kèqi, You’re welcome) are not considered a single word by the LCMC. Also, there are “words” in the new HSK that are purposeful combinations: 打篮球 (dǎ lánqiú, to play basketball) and 踢足球 (tī zúqiú, to play football), for example. The above images plot the number of words at narrow slices of the log rank of the word (which is inversely related to the frequency–high-frequency words have low rank). 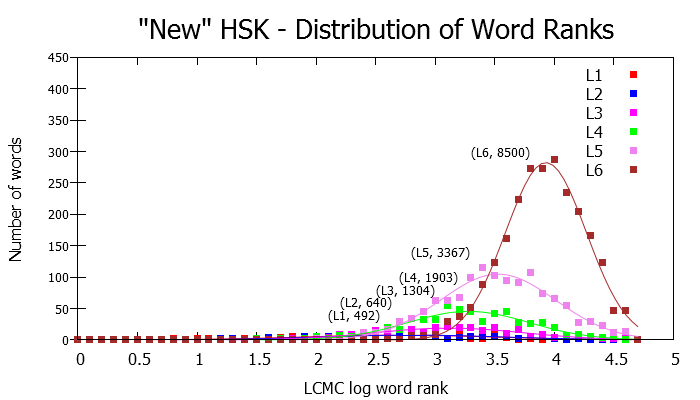 The graphs clearly show that in both the old and new HSK the different levels target a different difficulty of words. However, while the lowest and the highest level word lists have little overlap, adjacent lists have a significant degree of overlap. Note that plotting on a log-rank scale yields a fairly symmetrical bell curve suggesting a Gaussian distribution, despite the fact that because of the log scale, the left half of the curve has it’s slope exaggerated, and the right half compressed. I suspect this is just accidental, but it’s close enough to a Gaussian distribution that I can still estimate the peaks by fitting the curves. A second way of looking at the differences in the list is by following the individual words themselves. Do the words in the old levels mostly go to particular levels in the new HSK? Even before beginning the analysis, the large difference in the list sizes indicates that there will be a large number of words in the old list that are discontinued. With 8,000 words in the old and 5,000 in the new, it’s unavoidable that at least 37% of the old words will not be reused. 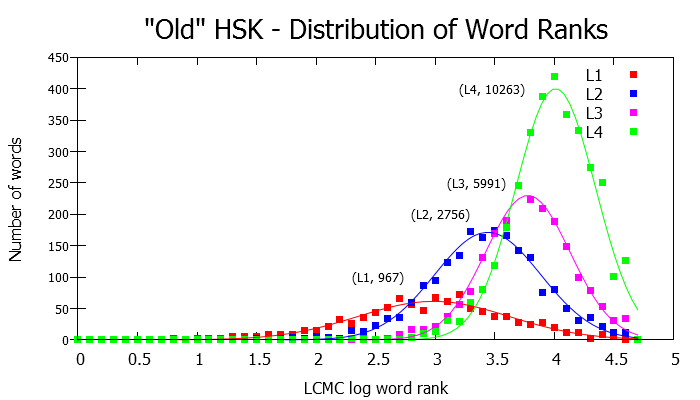 The two schemes proposing mappings between the old and new HSK vocabulary agree closely. The main difference between them is that the analysis based on word reuse clearly shows that many of the words in the old Level 1 end up in the new Level 4, which the word frequency analysis does not detect. On the other hand, the graph of word ranks in the old and new levels shows more clearly that while the old level 4 roughly maps to the new level 6, it only does so for the more rare words of the new level 6. For Chinese learners who have studied with the old word lists, here is a useful list of the words unique to either the old or new HSK. As time permits, I hope to continue looking at these lists on a more qualitative level. For example, is there a common theme for the words that have been discontinued and that have been added? Just glancing at the newly added words, some are internet and computer-related words (手机, 电子邮件, 上网, 笔记本), and some others are useful verb-object compounds (打电话, 打篮球, 爬山, 刷牙 and many more). Some redundancy was removed from the old. For example, 北方 was retained and 东, 南, and 西 as single characters were retained. But all the other x+方, along with all the x+边, x+部, and x+面 words were removed (and good riddance to the last three, which were not only obvious but were rarely used in real life). On the other hand, there were many words removed that would seem quite important. 窗 (window), 春天 (Spring), 大学 (university)?! These are words you would no longer be exposed to if you only relied on the new HSK word lists. My source for the old HSK word lists was a merging of HSK Flashcards, chinese-forums, and wiktionary. The wikitionary and chinese-forums lists were nearly identical, but there were significant differences between those two and the HSK Flashcards list. The source for the new HSK word list was from Lingomi. There is a chinese-forums thread also on this topic, although it concentrates more on the character lists instead of word lists. hi, hello, it is interesting to know such a guy who likes learning Chinese. I guess your Chinese is very good now.